TIGARD, Ore. (May 30, 2018) – An innovative, all-day dining program has made its debut at Summerfield Estates Retirement Community in Tigard, Oregon, offering the senior residents of this all-inclusive, resort-style community the luxury of dining any time of the day or night. Unlike the more conventional and outdated, three meals-per-day option, the new 24/7 Dining Experience at Summerfield Estates was specifically designed to accommodate a variety of daily schedules in addition to palate and dietary preferences. 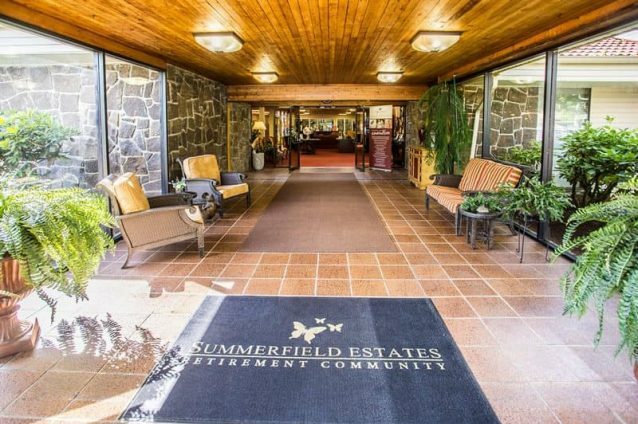 Located just minutes from downtown Portland, near shopping, restaurants, medical centers and more, Summerfield Estates is an independent living retirement community managed by family-owned Sunshine Retirement Living, based in Bend, Oregon. The new dining experience is just one of the pioneering programs and services that have been introduced at the community recently to enrich resident lives each and every day. Research has shown that seniors who socialize more with friends and family tend to live longer and healthier lives. For that reason, hours have been extended for breakfast, lunch and dinner at Summerfield Estates. The gourmet meals, which are served restaurant-style by a team of caring and friendly servers, combine traditional favorites with more contemporary regional, ethnic and seasonal items to appeal to various tastes and preferences. Recipes are rooted in fresh and delicious ingredients, sourced as locally as possible, including some that are grown in the community’s own gardens. Salads and soups are made fresh daily, and high-quality meats and proteins, heart-healthy grains, and gluten-free, vegetarian and low-sodium options are always among the selections. For residents, who are unable to dine during traditional hours, Summerfield Estates now also offers an on-demand menu that can be enjoyed anytime in the dining room or in resident apartments. This is especially beneficial to residents who become ill or who need to eat food with medications in the middle of the night. Meals can be delivered by the culinary staff or picked up by the resident – whichever is more convenient. Summerfield Estate’s kitchen is always open for visits from the local community by calling ahead or by just stopping in. The community is located at 11205 SW Summerfield Drive, Tigard, Oregon 97224. For more information, please call (503) 214-2059 or visit www.SummerfieldEstatesRet.com. Located in picturesque Tigard, Ore., Summerfield Estates is an all-inclusive, retirement living community, offering independent apartments with fully equipped kitchens, complimentary utilities, on-call apartment maintenance, and weekly housekeeping services. All-inclusive living includes all-day dining with gourmet, chef-prepared meals served restaurant style, complimentary local transportation, free common-area Wi-Fi, front desk concierge, and access to the salon, library, gym, and computer center. All residents receive complimentary membership to the Summerfield Estates Clubhouse, featuring golf, tennis, swimming, and a variety of social and fitness activities. For more information, please visit www.SummerfieldEstatesRet.com.